Want to save time and money on skip hire? We have the solution! Away With It has been providing builders waste removal Waltham Cross trusts for quality and reliability for more than a decade. All at great prices. Our fast, affordable builders waste removal service covering both EN7 and EN8 post codes is the perfect solution for all kinds of building and home improvement projects including rip-outs and refurbishments. Applying for a skip permit is a big hassle, not to mention arranging parking and access. Why go to all that effort when we can provide you with an on-demand wait and load service at a fraction of the cost to take all your waste away? We charge by the load and in most cases our service works out much cheaper than skip hire. The quote we provide will include all costs, including labour, transport and disposal fees. There are no hidden extras and you won’t get a nasty surprise when it comes to pay the bill. We will allocate you a two hour time slot for your collection and call ahead to let you know exactly when to expect us. So you can get on with your day and won’t be left waiting around for us. We are fully licensed waste carriers and have comprehensive insurance. You waste will be disposed of responsibly and legally and we recycle 80% of all waste we collect. 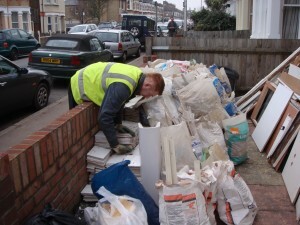 To discuss your requirements for builders waste removal Waltham Cross give us a call on 0208 504 7390. Our helpful team will be happy to provide a free no obligation quote and answer any questions you may have. Or fill out our online enquiry form and we’ll get back to you quickly.